Behind St Florent spreads the quiet, attractive countryside of the Conca d'Oro. Its villages are an integral part of the landscape, hugging the slopes where the hills begin to rise, the old stone houses looking as if they grew out of the rock from which they are built. 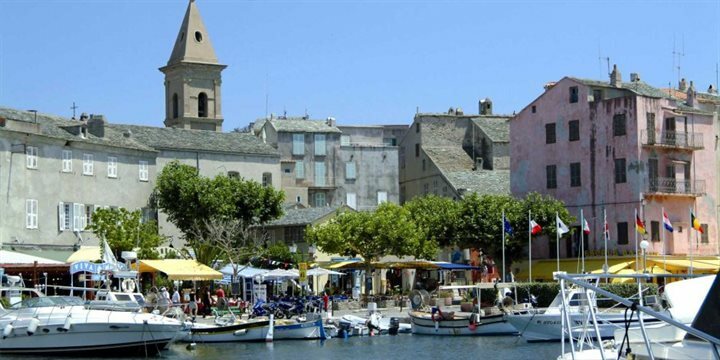 The bustling heart in St Florent is the old town, with its narrow streets and vibrant bar terraces. Relax in one of the waterfront cafés and watch the yachts of the rich arrive at the marina. The ambience on the port of an evening is not to be missed. Just watch the rich people and marvel at their luxurious yachts – a true pleasure seekers paradise. There is a pleasant coastal walk to the Mortella tower, 7km west of St Florent (be aware there is little shade). The ruined tower is one of the most impressive examples of Genoese architecture in the area. It was built in 1520 as a weapon against piracy; it fell into disuse as a result of its inaccessibility. The Désert des Agriates is a landscape of wild maquis and rocky cliffs. Take a boat trip to one of its beaches, inaccessible by car, or rent a boat yourself to explore the hidden coastline around the town. Boats from the harbour will take you to the beaches of Saleccia and Loto (3-6 departures a day and a 30 min trip). One can also get to these beaches on quad bikes (see activities section) which can be hired locally or for the more adventurous try kayaking. The spectacular beach of Saleccia is a tropical dream of silver sand and turquoise sea, inaccessible by road.